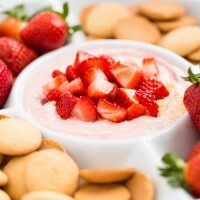 Strawberry cheesecake dip recipe- a sweet and creamy dip that takes minutes whip up. This dip tastes great served with strawberries, graham crackers or cookies. 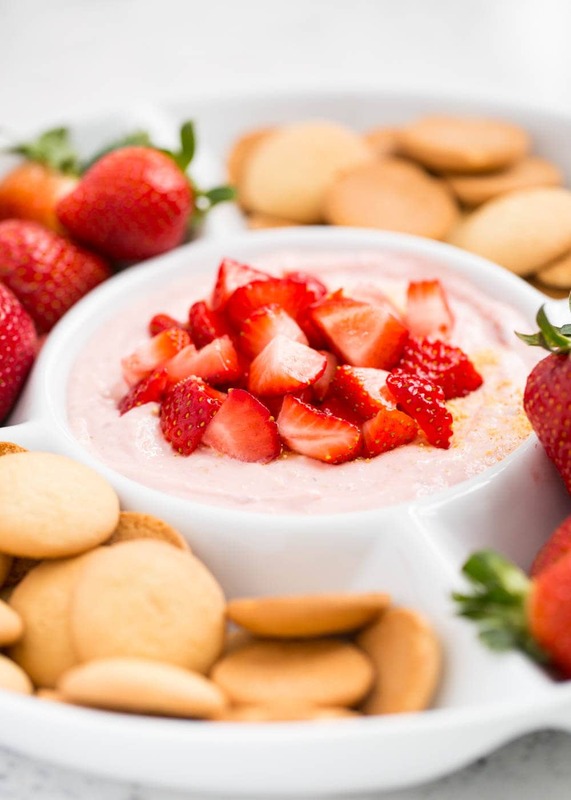 This no bake strawberry cheesecake dip makes a great appetizer for any party or game day. 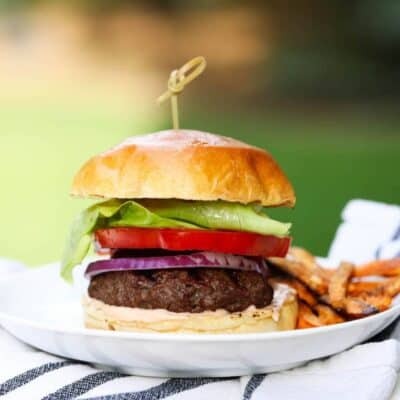 This is one of those recipes that is great for when you have one of those moments where you say “oh shoot, I forgot people are coming over and I have nothing to serve!” Please tell me I’m not the only one who has done that. This dip needs less than 5 ingredients to make and will take less than 5 minutes to whip up. Can’t beat that! 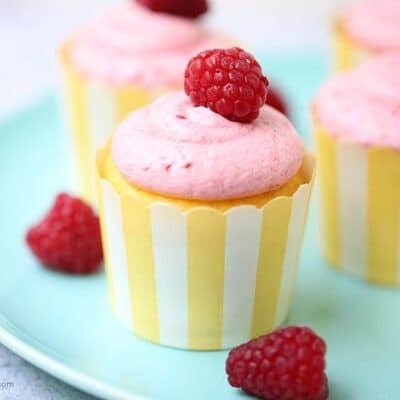 It is also a healthy treat you can feel good about and super yummy too. Especially with big juicy strawberries! Mmm! 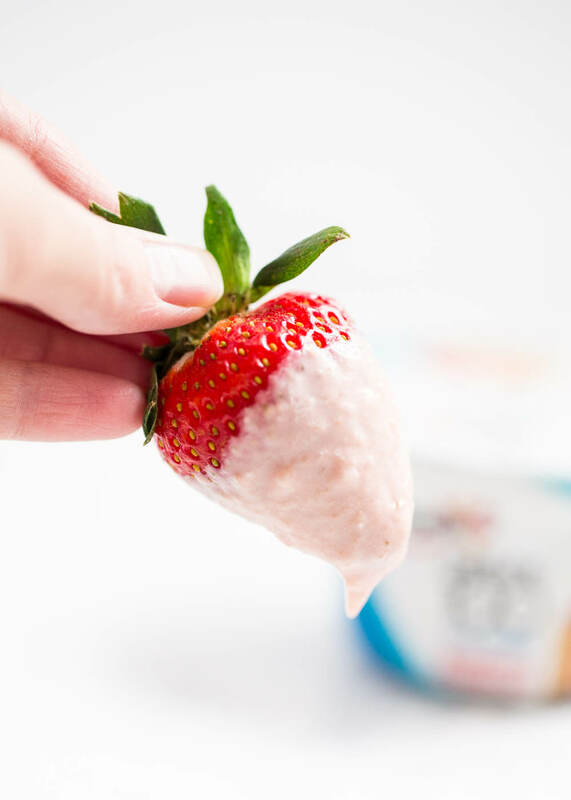 The secret ingredient in this dip is the Yoplait Greek 100 strawberry cheesecake Greek Yogurt. 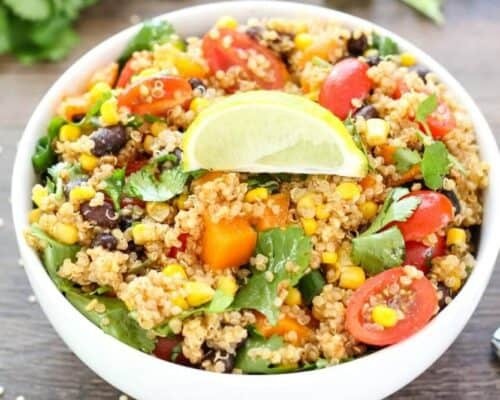 It makes it nice and creamy and adds extra nutrition too, making it healthy in my book! 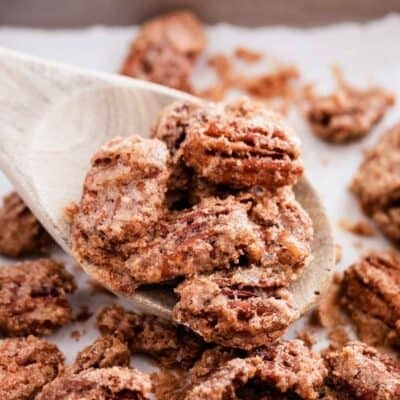 ;) The graham cracker crumbs also add a delicious touch. I’m excited to be partnering with Yoplait for this post to spotlight their Greek 100 Yogurt which is rich in calcium, contains essential vitamins and is a good source of protein. It’s no secret that yogurt is an excellent (and delicious) choice at breakfast … but it also makes a great snack or dessert. 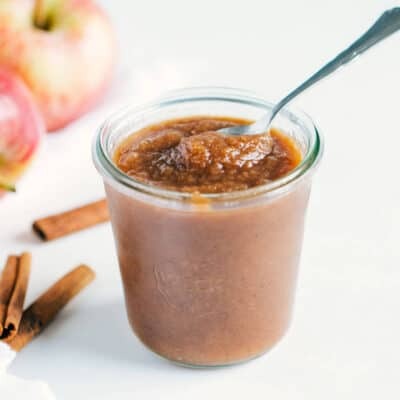 It is my go to snack, when I am craving something sweet at night. This post was brought to you by Yoplait. As always, opinions are 100% my own. In a medium size bowl beat the yogurt, cream cheese, marshmallow creme and 1 teaspoon lemon juice until smooth. Stir in 2 Tablespoons of graham cracker crumbs. Add graham cracker crumbs and lemon juice to taste. Right before serving sprinkle with graham cracker crumbs and diced strawberries, if desired. I love cheesecake dip! 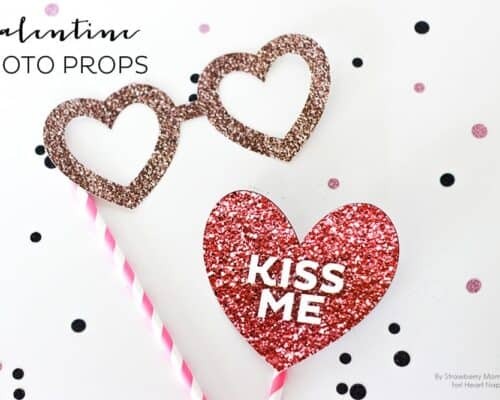 It’s perfect for Valentine’s or Galentine’s Day! This looks fantastic! Strawberry cheesecake is one of my favorites! Can’t wait to try this! 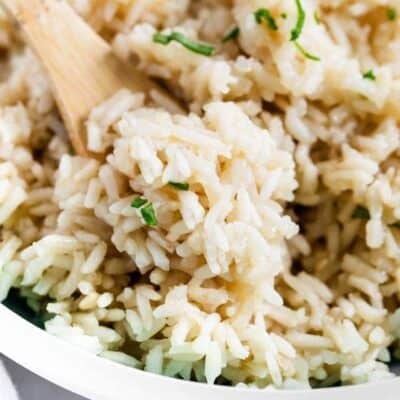 I love quick and easy recipes like this! And I bet the yogurt makes it nice and light. What a fun dip!! I LOVE those Yoplait Greek 100 yogurts, they are the only ones I eat. This dip looks DIVINE! 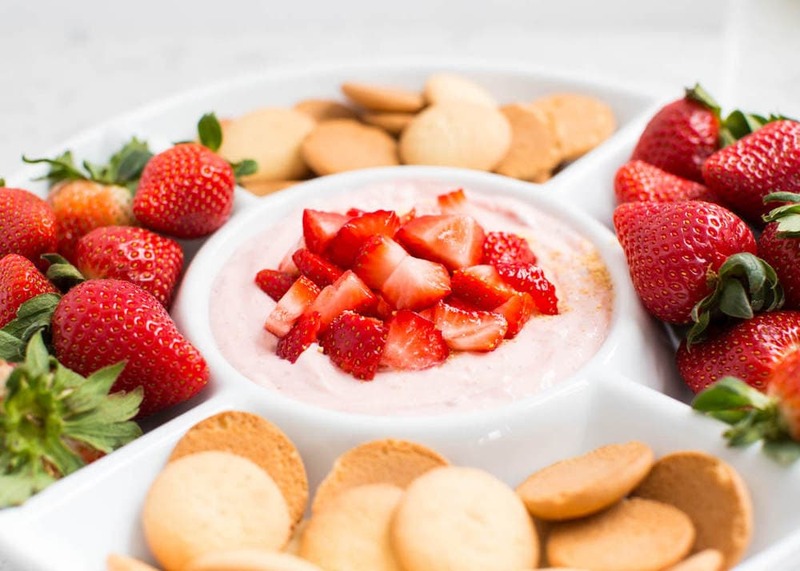 Strawberry cheesecake is one of my favorite desserts, so I can’t wait to try this lightened up dip! Yum! This dip looks delicious! And perfect timing for Valentines parties coming up!